Bengaluru: Chinese scientists have created monkeys with human brain genes to understand the evolution of human intelligence. In a study published in March in Beijing’s National Science Review, the scientists inserted the MCPH1 gene, which plays a role in the development of the human brain, into embryos of rhesus macaque monkeys. The monkeys that were born with the human genes exhibited signs of brain development very similar to human beings. However, scientists from all over the world have expressed concern over the ethics of this experiment, explaining the complication that could be caused if the monkeys had human-level of intelligence and consciousness. The scientists impregnated five surrogate monkeys and inserted the human MCPH1 gene into their embryos via a virus that carried the gene into the brains of the embryos. 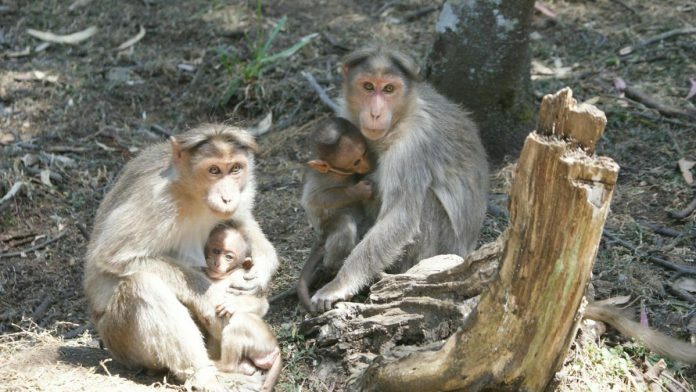 After a gestation period of 155 days, the mother monkeys delivered babies by C-section. Two of the embryos in one monkey were aborted, though it is unclear why, while the remaining four monkeys gave birth to a total of six babies — two of them delivered twins. One baby monkey, however, died of unknown causes 76 days later. Both the aborted foetuses as well as the monkeys that were born tested positive for the MCPH1 gene. The team of scientists then brought in 12 regular embryos to compare their brain development with the transgenic monkeys. Of these, four embryos were aborted at the same stage as the transgenic embryos, while two baby monkeys were killed 76 days after birth. The team performed MRI scans on the brains and tissues of the transgenic monkeys, and compared them to their regular counterparts. They then noticed patterns of neural reaction on transgenic monkeys similar to human brains at the early stage of brain development. In their paper, the scientists also stated they were able to observe a “human-like expression delay of neuron-differentiation and synaptic signalling genes” in the transgenic monkeys. The transgenic monkeys were also tested for their memory and reaction times. Compared to their unaltered counterparts, the transgenic monkeys displayed better short-term memory and reacted faster to stimuli. The scientists stated these experiments are the “first attempt to experimentally interrogate the genetic basis of human brain origin” by using non-human primates to understand traits that are unique to humans. One such trait is humans’ level of intelligence and consciousness, and the sense of self that seems to go far beyond that of other animals on the planet. An eternal quest in understanding the human brain, both in medical as well as psychiatric sciences, is about understanding how it innovated itself to such a high degree when close primates haven’t. The MCPH1 is not the only gene that is uniquely human. The authors of the paper have their eyes set on two other genes as well, which are involved in the evolution of brains. Bing Su, a geneticist at the Kunming Institute of Zoology who led the study, told MIT Technology Review that he’s already testing other genes. One of them is the SRGAP2C, a variant of human DNA that arose 2 million years ago. It has been called the ‘humanity switch’ and has been the subject of much discussion in the field of evolution of human intelligence. The other gene that has captured the Chinese team’s interest is the FOXP2, which enables humans to understand and learn languages. Bing Su previously spoke about fiddling with this gene three years ago, saying while he doesn’t expect monkeys to start talking, a behavioural change would be a certainty. All these discussions raise important ethical concerns of how to deal with apes that reach human levels of brain development. Several scientists, including one who collaborated on this effort, have called this experiment reckless and unethical. While the rest of the world stays away from using primates in experiments, China has previously used them in genetic experiments, including cloning monkeys using CRISPR just earlier this year. Su stated that while he understood the ethical concerns when it comes to apes like chimpanzees that share 98 per cent of human DNA, monkeys and humans are not that genetically close, and thus don’t need to be looked at with a strong ethical lens.